Have you had a mole for a long time or has a new mole appeared on your skin? Moles are clusters of skin cells that can be benign or cause for concern. Dr. Martha Arroyo and the Lakeside Dermatology team in Libertyville and Gurnee, Illinois can remove problem moles and help you determine the right long-term care to protect you against skin cancer. When skin cells grow in a group or cluster instead of spreading out across the surface of the skin, moles form. These cells are called melanocytes and produce melanin, which makes up pigments in our skin. Some types of moles emerge before birth (congenital moles), while others form after birth due to a variety of factors (acquired moles). Sun exposure and pregnancy are two conditions that can aggravate mole development. It’s important to use adequate sun protection to reduce the risk of developing irregular moles that could lead to skin cancer. What should I look for with my moles? While most are non-cancerous, moles can develop into skin cancers such as melanoma which can be profoundly severe. The most at-risk moles are those that appear after age 25 or that look different from existing moles. Changes in color, shape, border, and diameter are important to note and should be reported to your doctor as soon as possible. You should conduct regular self-screenings at home every month, and schedule a visit when you have a specific concern about a mole. If you have a family history of skin cancer or moles, consult your doctor regarding your recommended screening frequency. You should plan to receive a comprehensive skin scan every year at Lakeside Dermatology as well. Most benign moles can remain as they are and only need treatment if they change or make you feel uncomfortable about their appearance. If a mole needs further evaluation, Dr. Arroyo conducts a biopsy. A mole biopsy typically involves shaving or cutting out the mole so she can test it under the microscope for precancerous and cancerous cells. If the mole is cancerous, typically Dr. Arroyo removes the mole site and surrounding skin to prevent the cancer from spreading further. The wound should heal easily and you can return to regular activities shortly thereafter. 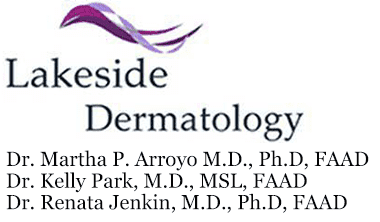 Dr. Martha P. Arroyo of Lakeside Dermatology in Libertyville and Gurnee, Illinois, is highly experienced in treating moles for cosmetic or medical reasons. Book an appointment by calling the office today to schedule a consultation for mole treatment.